The EU brings back subsidies for its fishing fleets. Is this the end of our tuna? Coastal nations of the Indian Ocean be worried, be very worried. On Thursday 4th of April, members of the European Parliament agreed to bring back fisheries subsidies, despite the risk of massively increasing overexploitation of fish stocks http://j.mp/2KfJ8pu. The Le Monde newspaper says that with the fisheries subsidies worth about 6 billion Euros, the European Parliament has jeopardized the commitments made 15 years ago to combat excessive fishing in the EU http://j.mp/2KfbPTs. However, for us in the Western Indian Ocean (WIO), where 40% of the EU catch of tuna comes from, this may mean the end of our tuna stocks. Currently, the EU strategy at the Indian Ocean Tuna Commission in terms of tuna allocations, if successful, will be devastating to WIO coastal nations particularly Seychelles http://j.mp/2OTDvvI. The new subsidies will help build newer, larger and more efficient fishing vessels that will now come to our waters and harvest our fish even faster than in previous years. The subsidies may possibly also assist fishing boats which are engaged in illegal fishing but perhaps more likely incentivise some fisheries activities which may not be strictly illegal but are shadowy in terms of evading quotas and national enforcement. And who watches the EU which has been accused of neo-colonial approaches to tuna fisheries http://j.mp/2OXjBQI? The yellowfin tuna stock is in deep trouble according to scientific estimates http://j.mp/2IknIEX. The deployment of thousands of Fish Aggregating Devices (FADS) by EU fleets leads to juvenile fish (which like to aggregate under floating objects) getting caught http://j.mp/2KdewVo. The subsidies will make FAD- fishing even more efficient, vacuuming even more juvenile fish out of our Exclusive Economic Zones (EEZs). Its been well known that most subsidies lead to more and more boats chasing less and less fish. This practice has been condemned by all international and environmental organisations http://j.mp/2VorReK. Recent studies have shown that without government subsidies, industrial fishing would be unprofitable http://j.mp/2Ii19ke. The European Union has been working for years with the World Trade Organisation (WTO) so that member states reach an agreement on the elimination of fishing subsidies harmful to marine resources http://j.mp/2KnO0ci. Why then this sudden volte face? Furthermore, in 2015, the EU committed itself to the United Nations Sustainable Development Goals (SDGs) including the Ocean Goal, Goal 14. Target 14.6 of this Goal states that by 2020 we must “prohibit certain forms of fisheries subsidies which contribute to overcapacity and overfishing, eliminate subsidies that contribute to illegal, unreported and unregulated fishing, and refrain from introducing new such subsidies” http://j.mp/2OTf5Cx. Is the EU sincere in its international commitments? The decision is a “dramatic backwards step”, said Andrea Ripol, fisheries policy officer at Seas At Risk. “Allocating taxpayers’ money to directly finance the construction of new vessels or the replacement of engines is counter-productive. This will fuel fisheries’ overcapacity, exacerbating the overfishing problem, without any guarantee of delivering any public good” http://j.mp/2KfjOQt. With this latest move the EU Parliament has sent exactly the wrong message to the rest of the world: we don’t care what you do to protect your marine resources because we are giving billions of Euros to Europeans so its easier for them to come and take what’s left of your fish. What are we in Seychelles going to do? Author Dr. Nirmal ShahPosted on April 7, 2019 April 9, 2019 Categories UncategorizedLeave a comment on The EU brings back subsidies for its fishing fleets. Is this the end of our tuna? Going Deep: a new strategy for saving Seychelles. Can our society prepare for a world in which global warming threatens large-scale social, economic, and political upheaval? What are the policy and social implications of rapid, and mostly unpleasant, climate disruption? These and other similar questions, once perhaps the preserve of fringe thinkers, are being seriously discussed by scientists, https://goo.gl/8pNWB2. Seychelles, like all Small Island Developing States (SIDS), with miniscule amounts of emissions and therefore no opprtunity to mitigate climate change, has taken the adaptation route. Adaptation and Mitigation are the two ways countries an deal with climate change. Adaptation is where a country or community attempts to put in place strategies, activities and infrastructure to blunt the inevitable impacts of climate change – including building set-back lines, restoration of ecosystems such as coral reefs and mangroves, harvesting rain water, building seawalls, and so forth. The size of Seychelles – the smalness of everything including the economy, population, habitable area and infrastructure – makes it ultra-sensitive to shocks. Perturbations that wouldn’t even tickle larger nations rattle our society. Mainstream adaption strategies are not really working. Climate change is beating us despite our best efforts. The government, private sector and civil society in Seychelles must come together very urgently to prepare for deep adaptation. The changes to be made in both mind-set and development strategies will by necessity be drastic. The population has to be prepared and the most vulnerable have to have protection. 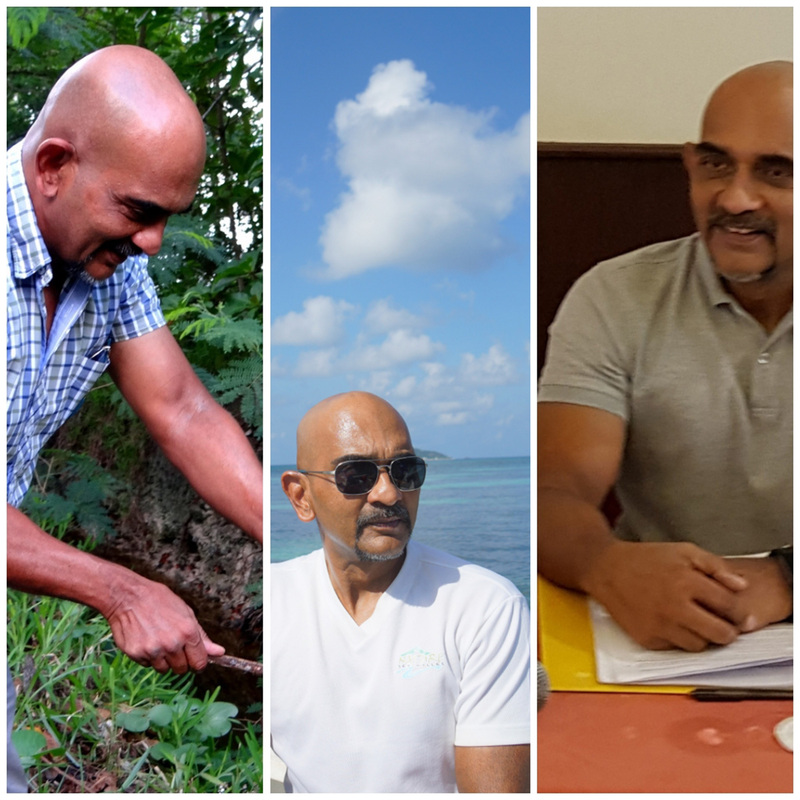 Author Dr. Nirmal ShahPosted on October 16, 2018 October 17, 2018 Categories UncategorizedLeave a comment on Going Deep: a new strategy for saving Seychelles. Today, I travelled from Mahe island to Cousin Island, via Praslin island on Air Seychelles, where the birds that inspired the logo of this airline thrive – the White Tern (Gygis alba). When I was growing up in Victoria, the capital city, this bird was common. But the Cape Barn Owl introduced by the British colonial authorities to get rid of rats found the brilliant white-coloured tern easier prey. Ironically,the Barn Owl, a protected species in several countries, found itself labelled an alien predator with a bounty on its head. In another turn of fate the coconut plantations, where the Ow did hunt rodents successfully, disappeared on the main islands from the 80’s onwards giving way to development. On other islands like Cousin, Cousine and Denis coconut plantations were removed to restore native forests. Where rats were prevalent they had to be eradicated with artificial bait. The industrial age of energy and transport z..u ws..ITony Seba of Standford University. M…..j. The Stone Age did not end becaj s …….. use we jran. z, .m out o…f rocks. It end. .. , the,,..ed because a disruptive technology ushered in the Bronze Age. The era of centralized, command-and-control, extraction-resource-based energy sources (oil, gas, coal and nuclear) will not end because we run out ofwq petroleum, natural gas, coal, or uranium. It will end be m..cause these energy sources, the business models they employ, and the products that sustain thsxaqeem will be disrupted by superior technologies, product architectures, and business models. This is a technology-based disruption reminiscent of how the cell phone, Internet, and personal computer swept away industries such as landline telephony, publishing, and mainframe computers. Just like those technology disruptions flipped the architecture of information and brought abundant, cheap and participatory information, the clean disruption will flip the architecture of energy and bring abundant, cheap and participatory energy. Just like those previous technology disruptions, the clean disruption is inevitable and it will be swift. What happened to Pope Francis’ Magnum Opus? This week I gave a presentation during the seminar held at the International Conference Centre of Seychelles on Laudato Si – Our Common Home, Pope Francis’ Encyclical. The Encyclical was relased on Earth Day in April 2015. Its now 3 years old and has been debated by many so I’m not going to discuss the content. Rather I want to talk about my personal experience with it. I read it as soon as it was available as a PDF on the net in April 2015. I read it from cover to cover. In my opinion its the most important document written by any religious leader on the human condition as it relates to nature and in turn back to itself. I am not a Christian but you don’t have to be a follower or even a believer to be taken by document. One of the things that amazes me is that it is the first time I see a major religious leader agreeing with scientists on matters such as climate change even though there a are prominent catholic politicians in the US and elsewhere who are science detractors and climate change deniers. In May 2015 I wrote to the Bishop Denis Wiehe of the Catholic Church in Seychelles about it and pledged my support to push it forward. The Bishop arranged an interaction between myself and the senior clergy soon after that. We must have spent at least a couple of hours discussing this magnus opus. At that time it was only available as a print-out. In July of that year the publication was released and the Bishop sent me a copy. That was in 2015. What puzzles me is that this incredible thesis has found so little traction even within the Catholic church. I couldn’t find any press documents and briefings from the Vatican on it. I would have thought there would have been educational and awareness’ resources produced. Nothing. At the Paris Climate Change summit in 2015, which I attended, it didn’t rock the international community like Time magazine said it would. Why is that? Why is it that 3 years later we are re- introducing it? I don’t have the answers to these questions but I believe they are important for us to debate. Author Dr. Nirmal ShahPosted on September 7, 2018 September 7, 2018 Categories UncategorizedLeave a comment on What happened to Pope Francis’ Magnum Opus? Author Dr. Nirmal ShahPosted on September 3, 2018 September 5, 2018 Categories UncategorizedLeave a comment on Colonial machinations: Court hears how the Chagos islands were carved from Maurius through threats and pressure.